Make patties as directed on package. Meanwhile, spread one side of each bread slice with dressing. 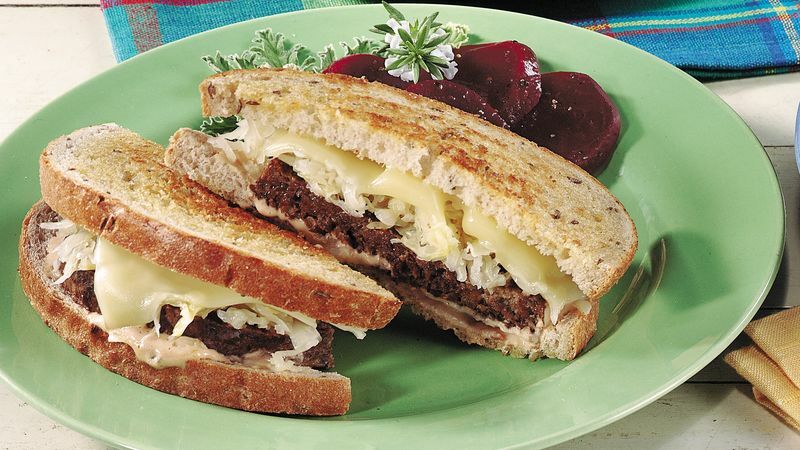 Layer 4 bread slices with patties, sauerkraut and cheese. Cover each with remaining bread slice, dressing side down. Spread tops of sandwiches with margarine. Heat medium skillet over medium heat until hot. Place 2 sandwiches at a time, margarine side down, in skillet; spread tops of sandwiches with margarine. Cook 4 to 5 minutes, turning once, until cheese is melted and sandwiches are thoroughly heated.